New Delhi, Nov 5 : The UN World Food Programme (WFP) and Alibaba Group on Monday announced their partnership to support efforts to achieve the "Sustainable Development Goal" (SDG) 2 -- a world with zero hunger. Under the framework, Alibaba will provide its technology and resources to support the digital transformation of WFP's operations. "Alleviating global poverty and fighting hunger is the shared vision of Alibaba and WFP," Sun Lijun, Chairman of the Alibaba Foundation, said in a statement. 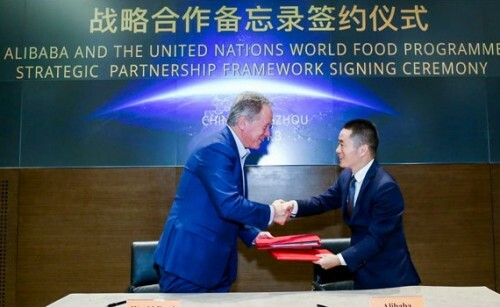 Alibaba will collaborate with WFP to develop a digital "World Hunger Map" to monitor the status of global hunger and help enhance the efficiency of operations to support efforts towards the goal of ending world hunger by 2030. "We look forward to joining the global campaign of fighting hunger using our innovative technologies in data intelligence and cloud computing, as well as sharing our experience in China and worldwide," Lijun added. The visual "World Hunger Map" is intended to leverage data insights to help WFP improve assessment and monitoring to increase efficiency and shorten emergency response times. The UN World Food Programme works in more than 80 countries around the world, feeding people caught in conflict and disasters.